Streetwear Official is a new retail platform taking aim at some of the biggest players in the highly-competitive online streetwear marketplace. As such, the team needed a top-notch site that not only looked like a multi-million dollar venture, but was also set up to work like one, both on the user experience level as well as the multi-vendor back-end management level. To build this site, we researched several solutions before deciding on an advanced Shopify ecommerce platform coupled with several key add-ons and extensive custom coding and styling. 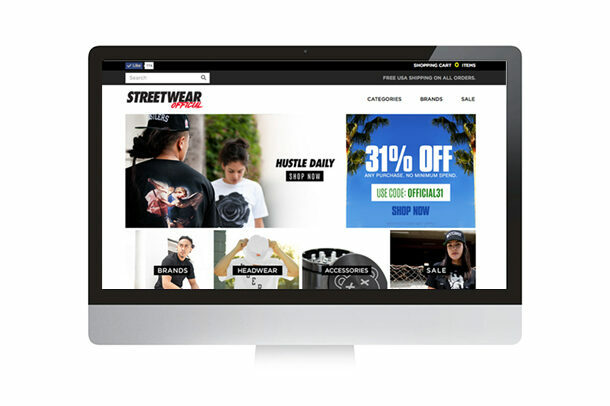 Above all else, Streetwear Official needed to be a highly-functional, and user-friendly site where shoppers can easily find products they’re looking for while also being led to discover new brands and gear. The Streetwear Official team had planned to market extensively through web and social media so converting those potential customers to sales was paramount. Stay tuned for more from Streetwear Official as they continue to grow and we help them develop this project further. Check out the site here: www.streetwearofficial.com.